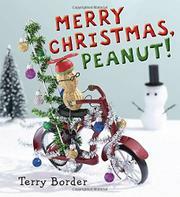 Border continues his food-as-characters shtick with this Christmas tale about a family of peanuts celebrating the holiday together. The unusual illustrations feature real peanuts, still in their shells, photographed in amusing scenes filled with small props and backgrounds of water, snow, or Christmas-cookie trees. The peanuts have wire arms and legs, character-differentiating hats, and wire-framed glasses that give the illusion of eyes. The main character, Peanut, who wears a propeller beanie, and his parents encounter difficulties on the way to Grandma’s house for Christmas dinner, such as a “traffic jelly,” instead of a traffic jam. They invite each peanut character who assists them to join the group and come along to Grandma’s for dinner, Peanut informing each one, “Don’t be sad! I’ll cheer you up! I’m the Merry Christmas Nut!” Each additional peanut has something special to offer, and with teamwork, the group solves further problems. The cumulative story has a traditional folk-tale sensibility with its repeated refrain, journey complicated by obstacles, assistance from strangers along the way, and rewards for those who help others in need. The funny conclusion shows Peanut and his family and friends enjoying their Christmas dinner with real (though tiny) food items, followed by an ice-hockey match on a Popsicle skating rink.